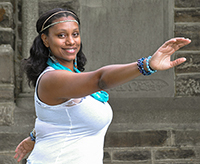 Candice, a longtime dancer and choreographer, founded Dance Alchemy in 2012 as a way to combine peace work with dance, creating a new way to connect people around the world for peace. Every culture on Earth has some form of sacred, spiritual, or ceremonial dance. Candice creates her choreography using elements drawn from a wide variety of these dances. The result is a completely new repertoire that crosses religious and cultural lines to unite hearts for peace. 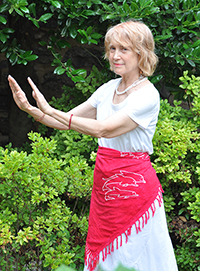 Candice has been dancing since the 1960’s, and teaching dance nearly as long. 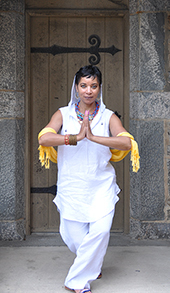 She obtained her Bachelors of Science in Education with a concentration in Dance in 1976. She has studied and performed modern, contemporary, jazz, ballet, Latin, ballroom, tap, and a wide assortment of international dances. Candice’s story is one of overcoming limitations. Early in her dance career, she was severely injured in a car crash, and the doctors told her that her dance career was over. But the love of dance burned as a flame in her heart. 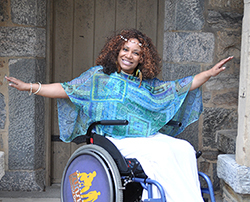 She recovered, earned a Master’s degree in Social Work, and began an alternative career as an advocate for people with disabilities. In 2012, she decided her dreams could wait no longer. She formed Dance Alchemy as a welcoming, safe place for people of all sizes, ages, genders, and ability levels to express themselves through dance — with a purpose: to promote peace, first within ourselves, and then our World. At the age of 9, Andrew was sent to dance classes to give him some “culture,” and so his parents could have a night off. He learned to dance – sort of – but he was more interested in running the record player, much to the annoyance of his dance instructor. Andrew crewed his first show at the age of 12, for a community production of Godspell in 1970. In the coming years, he found himself doing stage work again and again, throughout high school and into college, crewing for The King and I, Arsenic and Old Lace, The Sound of Music, A Streetcar Named Desire, and many more. Others wanted the to be in the spotlight, while Andrew wanted to hang the lights up and turn them on. After college and art school, he spent six years in the United States Navy, first as a Yeoman, and then earning designation as a Navy Photo-Journalist. Fast forward to the present, where Andrew is the Technical Director, roadie, business manager, photographer, movie-maker, and webmaster for Dance Alchemy. In support of Dance Alchemy, he founded Macs4Peace, taking in, fixing, and selling Apple computers to raise money for us. During her leisure time, Jackie enjoys Afro-modern and Caribbean dancing, teaching Pilates-fusion (a blend of Pilates and dance), and world travel. Dancing before she was born – much to her mother’s chagrin at the time and then to her eventual delight – Jenifer has danced ever since she can remember to manifest joy. She’s had some training in ballet, folk, modern, ballroom, swing, Lindy, and others, and still loves to do plenty of freestyle ranging from yoga of dance to occasional flashbacks to the 50’s and 60’s. A shaman for animals, Jenifer practices health and wellness in the Baltimore area plus distance healing. A long time fan of and cheerleader for Baltimore City, she lives there with her three wonderful dogs. 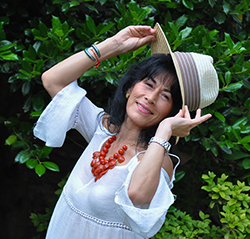 Originally from Lima, Peru, Lucy comes from a large family, and began to enjoy dance when she was just a little girl. A graduate of San Ignacio de Loyola University, she enjoyed a career in the travel industry before she settled in the Baltimore area with her two sons. Here she began to dance in various groups, and performed in professional dance videos. 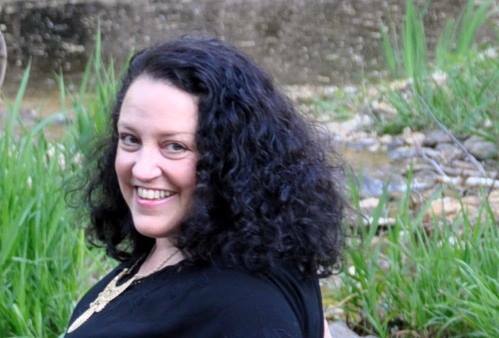 Sarahjane describes her life as “always having a soundtrack.” From Frank Sinatra and Sarah Vaughn, through the Beatles, Hendrix, Mo-Town, soul music, and on to the present day. In the early 70’s she was part of the Lamama Plexus troupe in NYC, performing off-off-Broadway, then traveled in Europe, and finally returned to the States to attend Law School. 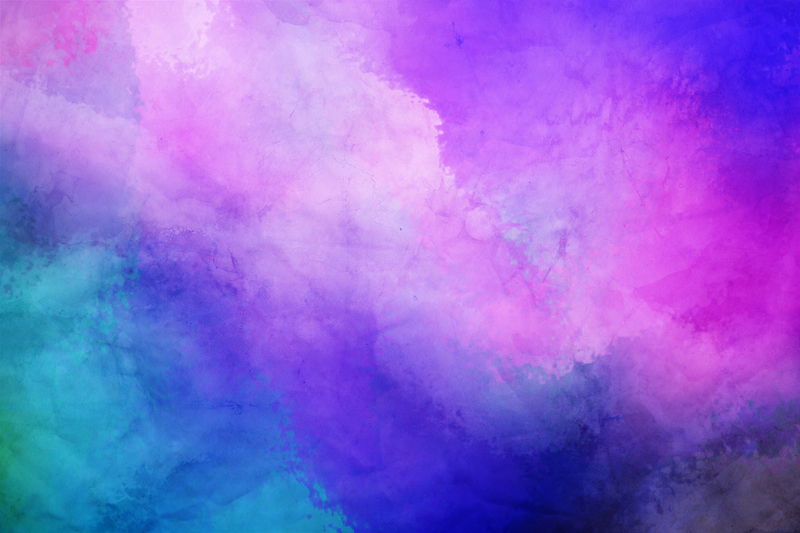 She says, “Imagine an artsy, intuitive free spirit going to law school and you will understand that it was not a lot of fun.” She found some relief in martial arts’ classes. Graduation was followed by work as a lawyer, a marriage, and motherhood. “Thirty years of practicing law went by like a flash,” she says. Sarahjane has been an environmental activist, a jazz festival organizer, and throughout all, a lover of dance. 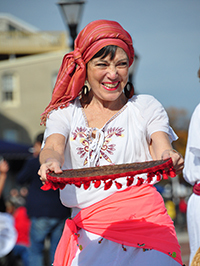 She has danced modern, jazz, flamenco, and even belly-dancing, joining a troupe called the Daughters of Haniel. 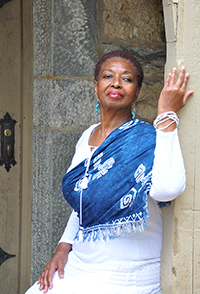 She retired, relocated to Baltimore, and has become a vital part of Dance Alchemy. Earleen fell in love with dance after an elementary school trip to see the Nutcracker Suite. She danced around the house on her toes until high school afforded her the opportunity to dance without any expense to her family. 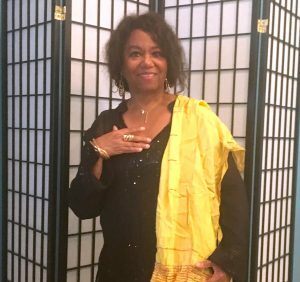 After raising two boys and retiring from a career in social services and customer service, she has indulged her passion for dance by taking classes with Maria Broom’s Dance Medicine, Dance Baltimore’s community dance, and Inferno’s African dance. Now, she says, it now all comes together with Dance Alchemy. Chris grew up in Baltimore, around lots of Polish relatives, and started dancing the polka at age 5. Throughout her childhood, she would come home from school, put on records, and dance around the house. Today, she and her husband enjoy dancing, and have taken ballroom dance lessons together. They also enjoy country line dancing, and Chris really loves swing dance. For years, she’s wanted to be involved somehow in dance therapy, and she feels that being in Dance Alchemy is a part of her progress along that path. 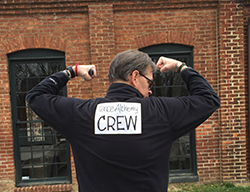 A lifelong resident of Baltimore, Chris is a graphic designer by day. La’Tonya was born and raised in Baltimore City. The mother of three adult children, she now makes her home in Baltimore County. Robin was born in “da Bronx” but grew up in Philly. She went to school in New England and lived in the Virgin Islands and Washington DC before settling in Baltimore. 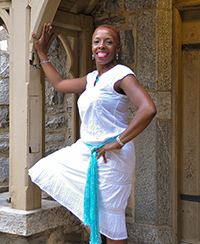 She had her first dance recital at the age of 4, went on to study dance in college, and moved to New York after graduation, where she was a member of Charles Moore African Dance Company. After a move to the US Virgin Islands, she was a member of the Caribbean Dance Company and taught classes for St. Croix School of the Arts. 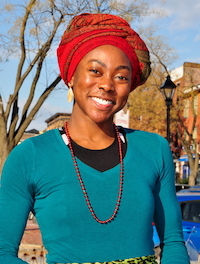 Returning to the Baltimore, she studied dance/movement therapy. 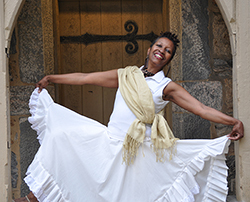 She also performed in Baltimore, Rotterdam, and Senegal with Sankofa Dance Theater for more than 20 years. Sunshine was born in Baltimore, MD. She’s been told she started dancing at the age of two, and remembers taking her first class at 5 years old on Saturdays. She attributes dance with helping her stay focused in school, and later it became a bigger part of her physical therapy. 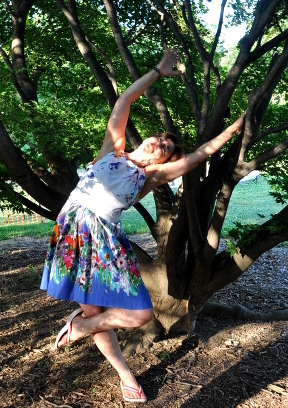 Hazel says, “From the time I danced as the Sugar Plum Fairy in our third grade production of The Nutcracker Suite, I knew I was hooked on dancing. Donna Rouse-Ashanti – happily married mother of one, grandmother of two, and “La-La” to many – has been dancing for as long as she can remember, especially to her favorite song, Mary Wells’ My Guy. She first publicly performed at the age of five in Cherry Hill’s modern dance troupe at the Community Center. La-La says friends refer to her as their “dancing machine” because she will dance to any and every kind of music, non-stop. Maria has loved dancing since childhood. At first, when her mother wanted to put her in dance class, she was too shy to go. When she was about eight, her cousin showed her some teenage dance moves, and this gave her the confidence to dance in public. She has mostly danced socially, and enjoyed exercise classes that were dance-like. She has also taken some Middle Eastern dance classes. 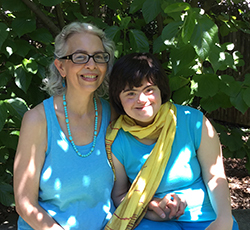 Maria enjoys sharing her love of dance with her daughter, Erin, including “dancing” in the car to popular music. Maria is grateful to Candice for her emphasis on the energy of dance, which she feels and appreciates in the special choreography that is part of Dance Alchemy. Erin loves music, dancing, and drama. She started her first dance class at age 7 or 8 at Towson University, in a class for children with special needs. 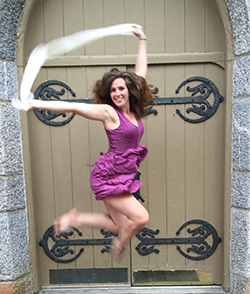 After a family move, Erin began taking “combo” dance classes at Kinetics Dance Theatre in Ellicott City, MD. While mostly following the prepared choreography, she also likes to add her own improvisations, much to the delight of her audience. Erin has also been an assistant in two dance classes at Kinetics. She enjoys dancing with Dance Alchemy — another opportunity to dance and spend some quality time with her mother, Maria. Alicia was born and raised in Baltimore, Maryland. As the daughter of a musician, she always loved music; dancing for my father’s audience created her love for dance. Diane, a former journalist, was born in Baltimore and lives in Howard County. She’s traveled to 38 states and 35 countries, many of them alone or with her daughter who at age 12, became her travel partner. She had had ballet lessons beginning at age 5, and continued dancing throughout junior high and high school; ut university, marriage and kids stopped her in her tracks, despite that she was always the last person on the dance floor at any event. Mairead was born and raised in the Twin Cities, MN, and started formal dance classes at age 7, after she traveled to Ireland and fell in love with Irish dance. 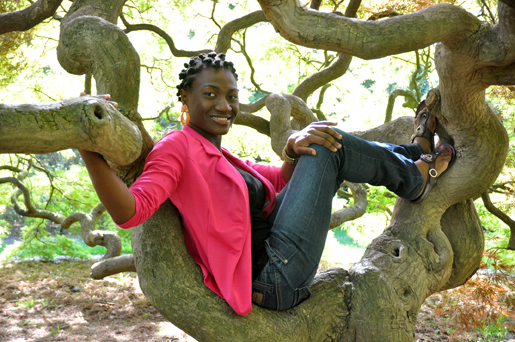 Since then, she has studied many forms of dance at many studios, majored in dance at Goucher College, and then studied dance abroad in South Africa and Mozambique. Nathalie was born in Montreal, Canada, raised in Japan and Paris, France, and has been living in Baltimore since 2003. She took ballet and tap dancing classes as a child, moved on to partner dances, and studied Bharata Natyam. Nathalie is a visual artist and her work on paper revolves around the feminine figure. It explores human movement and flesh through painting, embroidery, collages, and photography. Dancing with others is a great channel to put her work into real flesh and movement. Nathalie joined Dance Alchemy in August 2014 and says that rehearsing and performing makes her really happy. She loves the diversity of the group, and the joy which emanates from the dancers. Born and raised in West Texas, near the New Mexico border, Mira danced for the sheer joy of it, as far back as she can remember. Her parents used to joke and say “She has St. Vitus’ dance!” When she was still young, she begged her Mom for ballet lessons – the only kind of dance she knew of at the time. But as the oldest of six, and with finances an issue, it just wasn’t possible. Even getting her to the studio was inconceivable, so it never happened. They had a swing set in the back yard, and she got her Dad to remove everything but one bar. She used the one remaining bar for gymnastics, doing all sorts of aerial moves. In college, Mira took her first formal dance class, and she found it really challenging because she had never followed directions before, instead always following her own impulses. 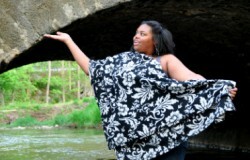 She decided to change her major to Dance, but was discouraged by the head of the department who said she was “too big.” She had to be content with dancing socially while she got her degree in Psychology and became a therapist. In that role, she found herself tuning in to peoples’ gestures and movements, so she went back to school and studied dance movement therapy. She also discovered Authentic Movement, and went on to study that discipline at Hampshire College. There she started the “Dream Dancing Workshops,” where clients were encouraged to move physically as they told their story. 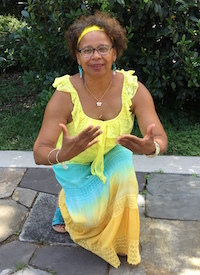 For years, she continued to work as a dance movement therapist, helping people heal as they expressed their thoughts and emotions through physical movement, getting in touch with their authentic selves. Mira finds that being in Dance Alchemy pushes her in positive ways, and she loves the diversity of the group, both in age and levels of ability. Finally, she has found a venue through which she can express her genuine self through dance in ways that effect the whole world. Joan, a Maryland native, was raised in a home “full of music.” Her mother sang a lot, and she also remembers her sisters putting on records and dancing around the house, grabbing little Joan to be their partner. In her 20’s, she took a year of ballet, and also gymnastics. 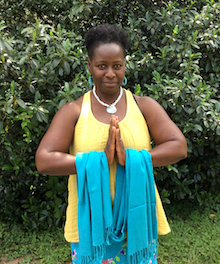 But it was later, when she saw a woman get up and perform sacred dance at her church in Westminster, MD that she said in her heart, “I must do that!” She began sacred dance classes, and was soon performing, finding that doing so opened her heart like nothing else. 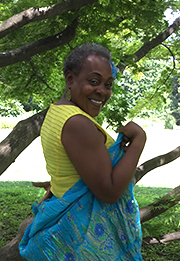 Patricia hails from Baltimore, where she started taking ballet classes at the age of eight. She continued with dance right through her school years, and performed in a dance company at American University while studying for her B.A. in Communications. Throughout college she studied, and later taught, meditation. She has also taken yoga and taichi. After college, she went to NYC where she studied at the Alvin Ailey American Dance Center. While there, she also began taking Middle Eastern dance classes, and performed several times in New York, then continued while in graduate school in Ohio. In 2005, Patricia received her black belt in kung fu. After an injury caused her to take a break from martial arts, she took samba and salsa classes. 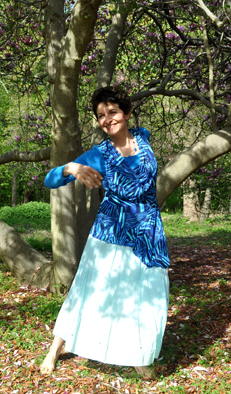 Patricia enjoys a wide variety of dance styles, including ballet, modern, salsa, samba, middle-eastern, and hand-dancing.